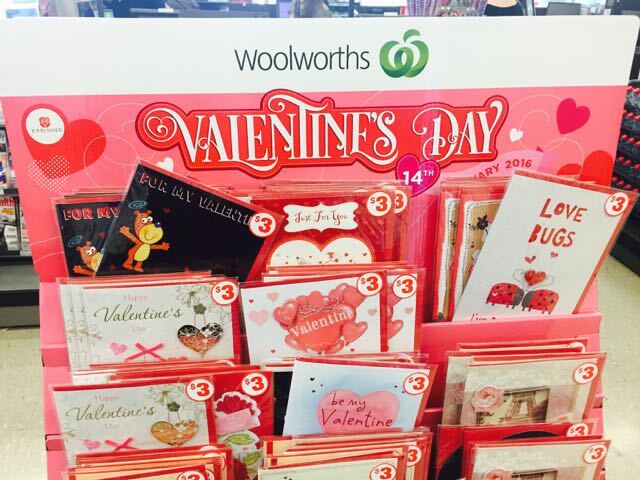 The stand of $3 Valentine’s Day cards at Woolworths that I saw yesterday was in the high traffic ground floor entrance location of the Sydney CBD business while the higher priced Valentine’s Day cards were in the second floor card department. While I get that supermarkets are interested in what they say is a ‘value’ pitch, it is not, in my view, value in that the cards look and feel cheap compared to the regular priced cards. Unfortunately, I suspect we will see more and more of these ‘value’ pitches the greeting card category this year and beyond. It is an overseas trend retailers here will not want to ignore. There are too many ‘value’ models in the UK and US for Australia to not be confronted by this phenomenon. It is only a matter of time before it hits here. I have looked at two of the models in detail may have more to say about them soon. We are already experimenting with $3 cards on a spinner outside the store. The card companies don’t like it and claim we are mad … but they would .. wouldn’t they. Our thought is to operate in the value market and make it harder for the UK situation to develop in our immediate area. If we don’t fulfil the need, somebody else will. We are finding the outside of store passing customer is different to the inside of store customer. For us, these value sales are additional sales. We have already seen this with discount books outside and full price inside, both of which are seeing sales growth. I am happily doing the 3 for $10 curated hallmark range and it is working a treat. That is different to cheap cards – singles for $3. In WA, cheap cards account for a major portion of the market, including in newsagencies.